9 x 4-inch Trim head Silver Star Star Drive Stainless Steel Wood Screws / 1.5M per carton approx. 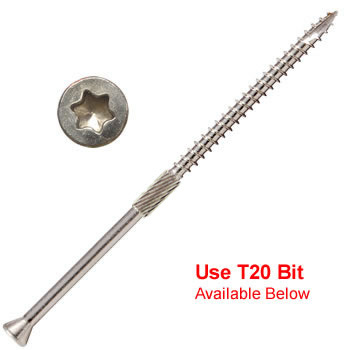 Includes Free T-20 Bit Type 305 stainless steel, deep six lobe drive, extra sharp type 17 auger point, true flat trim head (.26 inch diameter), 5 cutting nibs, deep wide sharp threads, excellent for hardwood, redwood, cedar and composites. Waxed & lubricated for easier driving. Available in bulk, 5lb and 1lb packages.